A Readers' Favorite Book Award Winner! Haunted by the girl he couldn't save in his youth, and the murder he committed to avenge her, Detective Track Presius has a unique gift: the vision and sense of smell of a predator. When a series of apparently unrelated murders reel him into the depths of genetic research, Track feels more than a call to duty. Children are dying - children who, like himself, could have been healthy, and yet something, at some point, went terribly wrong. For Track, saving the innocent becomes a quest for redemption. The only way he can come to terms with his dark past is to understand his true nature. What made the experience of listening to Chimeras the most enjoyable? I love audiobooks and as long as the reader is good they can make almost any story sound good ( no need in this case as this was awesome on it's own). But just having a nice voice read you a awesome story when you can't always read yourself is a wonderful experience. What does D. Joseph Fenaughty bring to the story that you wouldn’t experience if you just read the book? Miss pronounced words. I lived in SoCal for 20 something years and it was quickly apparent that he was not from anywhere near there. But other than my chuckles at those his narration was very good and kept my interest. Good story but I couldn't follow the narrator. I listened to half of the book, but the unexpected pauses and phrasing of sentences by the narrator prevented continuing. I finished the book on Kindle. 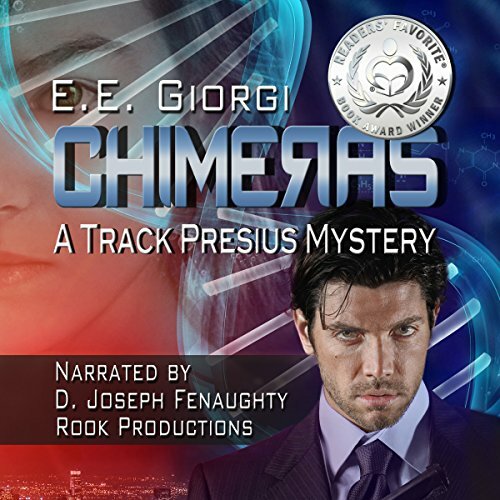 E. E. Giorgi is pleasantly expressive with scenes, aromas and character traits. Her sentences need to flow uninterrupted to form the images in the story. D. Joseph Fenaughty narrates with pauses where there are no commas or other phrase structure. At times, too frequently, he emphasizes an unexpected word in a sentence that redirects the visual image being formed by the sentence. In one sentence describing people leaving a tennis court he says, "...a blond (pause) and tanned couple..." Now in my mind I had already pictured a lone blonde woman but after the pause I'm left pondering was it a single blond woman and a tanned couple or was it a blond and tanned couple. Of course it was the latter, but my train of thought was interrupted. This happened in almost every paragraph. The plot was very good, intriguing and kept me engaged through the book. A unique slant on techno/science fiction mystery written by an expert in her field. It's still techno-babble but it is believable techno-babble that enhances rather than complicates the plot. That's techno-babble to the layman, no disrespect intended. Would you be willing to try another one of D. Joseph Fenaughty’s performances? I would have to sample it first to see if this performance was just his interpretation of this character. If other performances were as this one then I would not be willing to listen. Did Chimeras inspire you to do anything? Inspired me to buy the follow-on in Kindle. Good stories. I'm curious about the audio editing process. Does the author get to listen to the performance before it is released? the story of a cop with special senses was well structured and for me believable. it would have been good to read but unfortunately I had to listen while driving . the low voice seemed false and strained and fake. shame.